Holiday Lights at LoHI, Littleman Icecream Denver Colorado! //Sanchez Fun - live life and enjoy! Here's one of my Sunday blog share! Almost December! that means holidays are here! 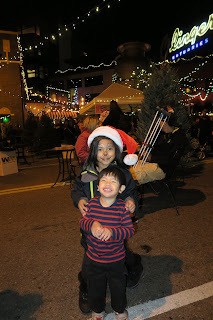 Yesterday we were at Littleman Icecream and joined the LoHi side of Denver for festivities! The Littleman icecream hosted a free event! Holiday Lights at LoHi. We were in line for icecream and first in line for free picture with santa! We vlog the whole event and enjoyed so much free stuff! Free pizza, free hotdog, free pull pork sandwhiches, free petting zoo with the mini horses, free jumping castle, did got a chance to try the free carriage ride but Alyza got the free face paint! They are very generous with this event, of course with the help of their sponsors! So many people attended. I remember looking at the rsvp in facebook it says 765++ are going and then almost 3.5k are interested! great turn out for this event! Thanks to Littleman Icecream for hosting free event. This blog/vlog post is not sponsored. We paid $9 for our parking, paid our ice creams and enjoyed the free stuff i mentioned earlier. ps. More holiday events! Cant wait to share it all! !